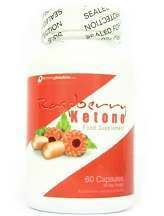 What is Slimming Solutions Raspberry Ketone? Slimming Solutions Raspberry Ketone is a daily nutritional supplement that intends to promote weight loss by providing the recently popular supplement called raspberry ketone. Raspberry ketone became popular for weight loss after it was mentioned on a television show in February, 2012. Since then its uses have multiplied, and raspberry ketone has become popular for hair loss prevention via direct application to the skin, as well as being used as a fragrance or flavoring agent in foods, cosmetics, and other manufacturing. The raspberry ketone, also described in some medical journals as 4-(4-Hydroxyphenyl) or butan-2-one, is the chemical found in raspberries responsible for its distinctive fragrance. While the product does not list the ingredients that comprise the capsule, the product is listed to be unsuitable for vegetarians or vegans. Users are directed to take two capsules orally with water; one capsule in the morning and one capsule in the afternoon. The product appears to be available only from the manufacturer’s website, which only offers shipping within the United Kingdom. The price was listed at one bottle for 39.99GBP, which converts to $51.90 in US dollars. For a bottle of 60 tablets, this is a price of $0.87 per tablet. The website also provides the option to purchase 6 bottles for 48GBP, which converts to $62.31 US dollars. This works out to a cost of $0.17 per tablet. Slimming Solutions Raspberry Ketone does not list any potential side effects. Slimming Solutions Raspberry Ketone comes with no manufacturer commitment or guarantee of any kind, which may put people off if they are unable to return the product if they get unsatisfactory results. Slimming Solutions Raspberry Ketone offers the raspberry ketone supplement that has become so popular of late in a standard form. At the time of our review, we could not find any user reviews for the product online, so we are unable to determine what the user experience has been like with this particular supplement. In our review, we noticed several strikes against the product. First and most obviously, readers outside of the UK need not read further, as this product is not available to them. At the time of this review, the product was only available from the manufacturer’s website and did not ship outside of the UK. For users inside the UK, we remain hesitant to recommend the product. First of all, in order to purchase the product for a price that is at all reasonable, it is necessary to purchase 6 bottles at once. Secondly, the highest quality raspberry ketone supplements will include all-natural raspberry ketones at a dosage of 1000mg daily. This product makes no claims whatsoever about the quality of its raspberry ketones, and offers only 200mg daily. We believe it is possible that consumers interested in trying out a raspberry ketone supplement will find a higher quality product at a lower price.